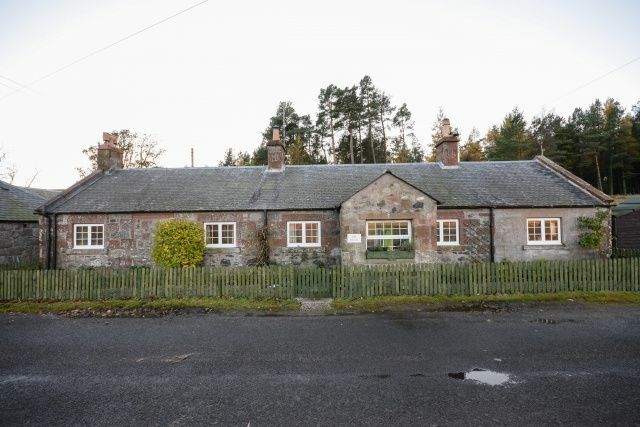 Stone and slate merge into the countryside and hills with rugged good looks as this traditional cottage sits proudly on Glen Clova, yet this desirable home is a mere 24 minutes from Kirriemuir and all amenities providing access to all other arterial routes. A bus service runs to Kirrie twice a day. The use of Rayburn stoves and multi fuel fires not only create a romantic hideaway but, for those lucky enough to live here permanently, ensures self resilience in even the toughest of conditions raising this home to a much higher level of comfort. The dual aspect of the cottage ensures views from every room and the half-acre (approx.) plot provides scope for self-sufficiency. A thoughtfully constructed porch greets the traveller on arrival and provides sheltered space to deposit coats and boots. The spacious lounge offers space for dining and relaxation and a large multi-fuel stove acts as focal point and can be used as an alternative to oil to run the central heating system. The kitchen is contemporary with a country feel and marries country style cabinetry with Belfast sink. An oil fired ‘Rayburn’ runs the central heating as well as cooking. From the kitchen a second porch opens to the gardens and hills beyond. The master bedroom has a small multi fuel burner for added attraction and the second bedroom has a small feature fireplace. The bathroom is well fitted with bath and separate shower cubicle. Overall this cottage is presented as a homely and comfortable residence. The property benefits from a private water supply and a septic tank. A small burn runs the outer length of the garden and there is parking just off the road with sheds and bin stores. Whether seeking a weekend escape or a permanant residence in glorious Scottish landscape, this cottage is not to be missed.